There is no big deal to crack or pop the human bones and joints. Many people literally prefer to do the same for just feeling better. They enjoy stretchings and do it every single day. As we all have experienced, many times our joints of knees, elbows, wrists, or fingers get stubborn and unable to move properly. At that time, a good minor pop can make the life easier. The same thing goes with the backs and shoulders. 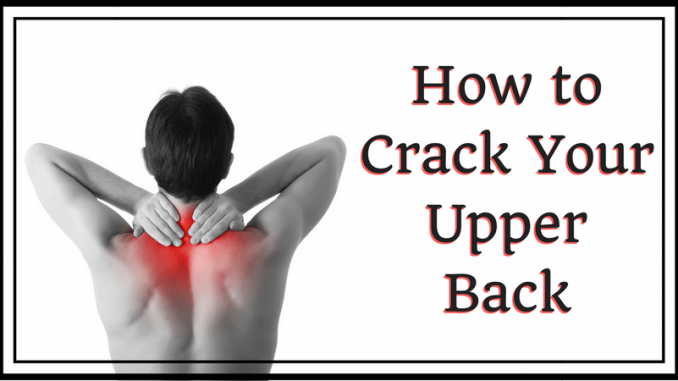 To crack upper, lower, or center back is not difficult, but it is quite tricky compared to other joints. Mainly, you need to find out the exact place you want to pop. You can crack such portions naturally, or by using some props, or with the help of your friends! Let’s find out some natural methods which can give you instant relief! Okay, moving on the main topic of today’s discussion, here is a quick guide on how to pop your back by yourself, especially how to crack your upper back as many people don’t have any tricks about it. I want to help you to release that tension up there and get that relief that you want so badly without going to a chiropractor. How to Crack Upper Back? You should do this on the hard surface like floors. 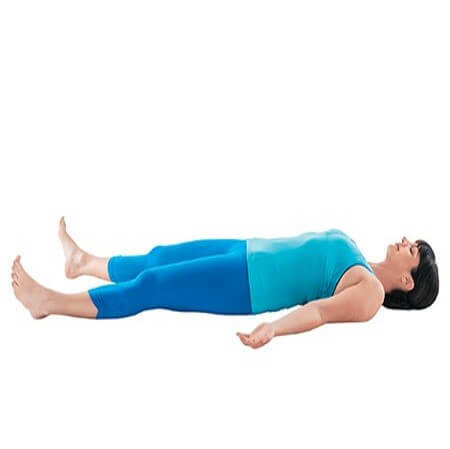 Lay on your back first and angle your knees. Then, lift your arms up straight and try to hug yourself tightly by your own hands. Make sure that your shoulder blades are coming apart. After that, you should breathe in deeply. You will come upside a little bit (just like you do crunches!) Now, let your body to fall back down. That’s it. You will have a couple of good cracks there. That’s your upper back. Stand straight. Place your hands on the center of your spine with the open palms and put them on top of another. Press both your hands towards your back as high up as your hands will reach. Pull up your chin to stretch backward leaving your hands pressing on your spine. Keep repeating this exercise until you realize minor pop. Once you got the right crack, stop! Otherwise, you may feel pain or discomfort. Sit in a chair which has a short back. Set your hips towards the edge of the seat until the chair back touches the part of your back you wish to crack. Place your hands on your upper head and try to push your head slowly. Do not forget to exhale while practicing this stretching as it helps you to push your back towards the chair. So, this exercise will undoubtedly offer you a few good cracks. Stand up straight. Use the corner of wall and try to touch the corner by the middle of your back. Give your arms some backward pushes so that you can find the exact spot. These soft moves can help you to crack your back by yourself and give fast recovery. Lay down on the floor. Pull your knees and bring it near your chest. Grab your feet with your hands. Then, tuck your chin to your chest and use the legs to push against as if you are trying to arch your back to touch the opposite wall. Turn the other side and repeat. Medicine ball is readily available on the market and may become one of your best investments. It is not at all expensive and yet having the ability of instant pain relief. Whenever you have a question in mind how to crack your upper back, go for the medicine ball. Middle back – Crack your middle back by sitting on the exercise ball. Slowly move your legs at the outer side and lean on the medicine ball so that your back can lay on it. Allow yourself to relax completely. Slowly move forward and backward, so the ball can push itself over different parts of your back. Upper back – For cracking the upper back, kneel in front of the exercise ball. Slowly move the ball and lean further as the ball moves away from you. Once the ball fully goes out holding your hands, allow your upper and center back to stretch and sag for a bit. Lower back – Lay your chest and abdomen on top of the medicine ball. Touch your toes on the ground but make sure that your knees do not touch the ground! Let your arms to hang loosely around the ball and relax the muscles in your back. If you feel extreme pain and couldn’t even pull up your hands to help yourself, then you must take help from someone else to crack your back. Lay down on a firm surface like a floor. Have your arms at sides, elbows bent, and hands on either side of your head. The head should be on one side. Now, ask your friend to give you a quick massage to relax and help you with your tensions and the stubborn muscles. Allow them to put their pressure on either side of your spine; their thumb should point toward the center back. Exhale at the time of this practice of pushing up and down at the same time. The hands of your friend must touch your back and slide upside near to the neck. Have patience, even if you can’t explain them the actual spot. Let them start from the middle of the back and work upward little by little. They should eventually find a spot that will produce a few good cracks for betterment. So, these were the methods about back pops. But, there are plenty of people who have some issues regarding cracking shoulders by themselves. And why not, it is a bit confusing as you don’t know what to do to pop the exact joint to feel good. 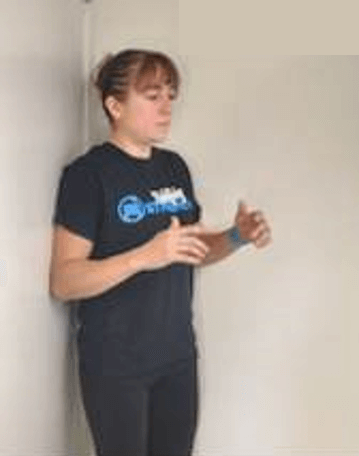 Here, I am giving two steps for the basic shoulder cracking. Stand straight. Lean forward by keeping your back straight. Let your shoulder hang and go round and round in big and small circles. If you want to hold something for the support, you can use a table. Again, do some circle right to left or left to right for about 5 10 minutes and if it feels good, then continue. But if it keeps bothering you after 5 10 minutes, try to follow step 2. To crack your shoulder, stand next to a table and put your elbow on the table. Make sure that the whole hand will be in the L shape. Bend your knees to be sure that the drop is good. Now let go and drop hard. You will hear a mild sound of shoulder pop. That’s how you can pop/crack shoulder. So, that’s all for cracking shoulder and back. Try to do one or two exercise a day for betterment. But as mentioned above, whenever you feel uncomfortable, just stop the stretch and do not try further. There are many chiropractors and massagers out there who can guide you for better results. If you are comfortable enough with such stretches, then try all of these exercises to choose the best one for you. I wish all of you all the best and have a healthy, happy, cheerful life!